Classic Japanese cars are getting a lot of attention as of late. I use the term “classic” loosely, as most people would look at a 70’s corolla and say “what an ugly econobox”. That’s okay in my book, because people said the same thing about many of the 50’s and 60’s American cars we now adore as classics. 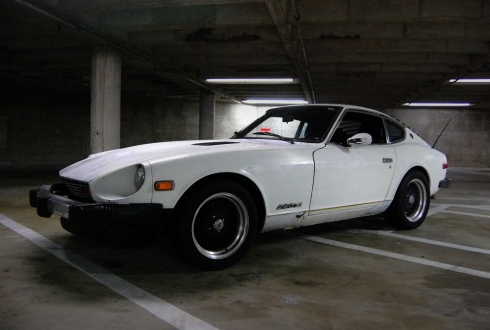 There’s little argument that most famous of all classic Japanese cars is the Nissan 240Z. When the 240Z hit showrooms it not only changed the way people saw Japanese cars, but it revolutionized the way the Japanese saw themselves, and that is kind of a big deal. Here was a car that was not only affordable, but looked great, had enough power to be a hoot, and amazingly started raking in the trophies at the track. A little while ago I had the distinct pleasure of visiting with a Datsun Z-Rodder who got into the “Z Car” long before the recent trends. Tim McGovern has had a vintage Z in daily driver status nearing 20 years, and not only has he built some amazing stuff, but also has some big plans. 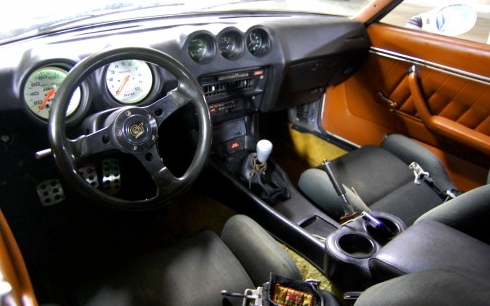 Tim kept apologizing for the “mediocre” status of his driven daily 280Z. I would just laugh as I just sat back and enjoyed the drive. There’s just simply nothing like the burble and scream of triple Mikuni’s and being in a Z. And there’s also nothing quite like those body lines that, though certainly 70’s have such a timeless shape that’s hard not to like. The paint is what could be described as a “20/20” job, in other words it looks great from 20 feet at 20 mph. The interior is pretty much stock, and actually all there. As I looked around the inside the only word that came to mind was homely. It should also be noted that this car is rock solid when it comes to being a “driver”. If this car sees downtime it’s because Tim is choosing to change/work on something. Even though it’s carbureted it starts as readily as a brand new car. There’s no uncertainty about the suspension. There’s no scary jerry-rigging that would scare MacGyver. Can You Tell That I Like this Car? Why? This beast gets driven. Beaten. Every nook and cranny has signs of wear. But it’s simultaneously loved and cared for. This is a very rare combination. Another big help is that Tim knows his stuff when it comes to engine building that though he kept calling it “very mild” it would be anything but mild to most people’s standard. PLENTY of “get up” for something you drive to work every day. 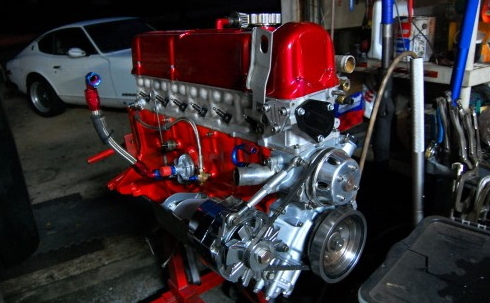 Under the hood she sports a stroker motor that’s put down 219 horsies to the wheels. Combined with the triples the gas mileage became anything but stellar when he put this motor in the car in ’09, so he doesn’t see much daily use anymore. Pressing on the right-hand pedal though, it’s certainly capable. Oh, most certainly. Sometimes though, there’s just no such thing as “done” for some people. Tim also has a Z that’s a dedicated track car as well as another Z that’s going to be kind of professional resto-mod daily driver. Tim is currently working on a Z engine that’s turbocharged that should be putting out a healthy 350 HP or more to the wheels. And to be clear, Tim isn’t using a modified modern engine like the 2JZ out of the famous Toyota Supra, which would make that kind of power much more readily, but is actually using the Z car “L engine”. Quite a feat for some redneck in his garage if you ask me. The nice thing about a turbocharged motor is that it’s “power on demand”, or dynamic power so to speak. Drive nicely and you’d never know the power was there, which really helps keep the gas in the tank. Meeting Tim was a pleasure, and an honor, but if there’s something I really should share about my experience it is something that often gets overlooked when it comes to the car hobby. 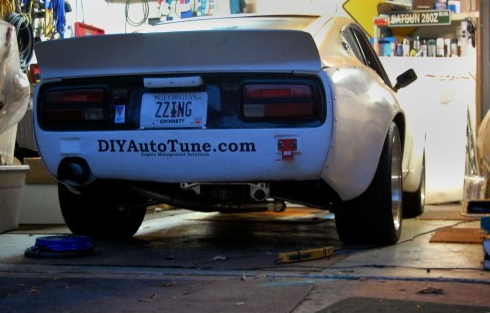 Tim modified his Z to the point of not desiring to drive it every day. That doesn’t make him like it less, but it certainly puts a damper on things. If you look at the direction Tim is going you can see he’s learning what really matters to him and how to go after it. As enthusiasts, we often overlook the value of a dedicated track car. We’re are often prey to escalation. One day 200 HP is enough, the next we’re shooting for 500. By having a dedicated race car Tim doesn’t have to be concerned about getting his speed kicks with a car he also drives to work. Oh, and check this out. Since the 280Z wasn’t getting great gas mileage he’s been daily driving this in the mean time. Cost him a whopping $567 to get it home and in running condition. He’s put a LOT of miles on it and it’s still ticking strong. In the words of the Georgian owner “she’s a good ol’ gal”. Couldn’t have said it any better myself. Wow really, us old folks don’t know about “classic Japanese cars”? Q. Who do you think bought them all when they were new? A. People who are approaching or over 60. The rest of the article was great btw. I believe Nathan was referring to the fact that now the younger generations are catching on to how great these classic Japanese cars still are. I’m sorry you seem to have misunderstood me Bill, but I never accused any older person of not knowing about old Japanese cars, but was pointing out that many people don’t realize the renaissance of popularity they’re seeing. 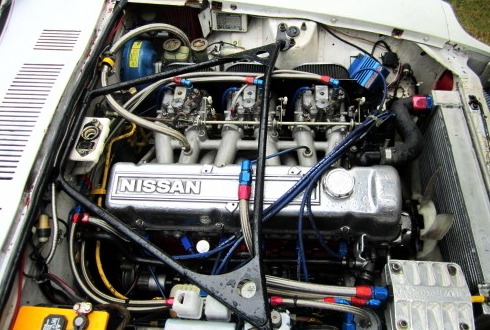 Many people over 50 who bought a datsun as their first car don’t realize that there’s now websites like japanesenostalgiccar.com who specifically cater towards the younger crowd, because that’s who’s buying these cars on the used market. 5 years ago, I could pick up a 510 for under $1,000 and in GREAT shape. Now the same car would sell for $8,000+, and that’s not due to supply drying up, there’s just that much more interest, and it’s all been from the younger generations. So yes, I acknowledge that Nissan sold a LOT of Z cars, and a LOT of 510s, and Toyota sold a LOT of cars too (corona, celica, and corolla to name a few) and I meet the people who owned them all the time and they tell me stories about how much they loved their cars. But they’re rarely the ones who own them today I find. If you don’t believe me, I’d like to direct you to ratsun.net. Stay there for a while and see for yourself the average age of the people hot-rodding their Datsuns today. I’m glad you liked the rest of the article.